When people are too old or ill to care for their kitties, the Room 8 Memorial Cat Foundation steps in to lend a paw. Cat Behavior My Cat Sleeps on Me – What’s Up With That? Volunteering at Room 8 Memorial Cat Foundation in Riverside, Calif., turned Gail Shelton into a full-fledged cat person. She’d never had a cat of her own, but caring for and getting to know the kitties at the shelter quickly taught her just how expressive, funny, and unique cats can be. "When I started volunteering, I had no idea that cats really had personalities," she says. "They’re amazing -ÔÇô and watch them when they’re mad. When a dog wags his tail, he’s happy. When a cat wags his tail, you’d better watch out." Shelton’s animal-rescue journey started in 1996, when her mother, a caretaker at the shelter, invited her to help her clean litter boxes one day. "I’ve been here ever since," she says. Her husband, Jack, is a cat person, too. They bonded over their mutual love of animals and were married last March, and together they manage Room 8. The shelter was founded in 1972 by Hettie L. Perry, also known as the Cat Lady of Pasadena. Before opening the shelter in Riverside, Perry cared for countless stray, feral, and homeless cats in her private house and barn. When Shelton’s mother took over after Perry passed away in 1996, she found more than 260 cats on Perry’s property, which Perry had fed and cared for using her Social Security money. "She was a woman in love with her animals," Shelton says. "She never, ever said no to anyone." Perry gave the shelter its distinctive name after being inspired by a children’s book about a cat named Room 8. 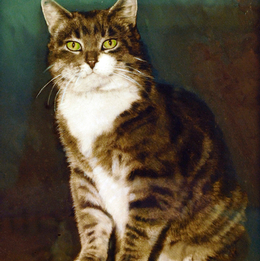 In 1952, a brown tabby took up residence in room 8 of Elysian Heights Elementary School in Los Angeles, befriending teachers and students. For more than 16 years, the cat never missed a day of class. Perry decided that Room 8 the cat would be her shelter’s mascot. While Perry’s original goal for Room 8 was that "no cat would be without a home," Shelton has narrowed the shelter’s focus. The majority of her 80 cats have come from elderly people entering nursing homes or individuals who can no longer care for their pets due to illness or financial concerns. 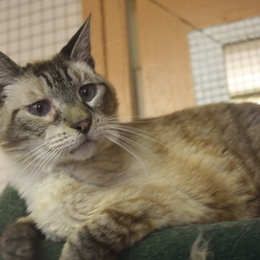 More than 80 percent of the kitties are more than 10 years old, and many spend their lives at Room 8, but they are all available for adoption or sponsorship. In caring for the kitties, Shelton has the help of many volunteers, including four adults, nine special-needs adults, and 10 high school kids, who earn school credits for racking up at least 120 volunteer hours. "I want people to know their animal is taken care of," she says. "That’s where my heart is, and that’s how I run it right now. When we take an animal in, if it doesn’t get adopted, we will keep it for the rest of its life." Because she rescues cats primarily from individuals’ homes, Shelton has encountered many hoarding situations. She has seen more than 70 cats living in a two-bedroom apartment, for example, many of whom were still feral despite living indoors. On another occasion, she went to a hospitalized woman’s apartment expecting to rescue two cats but instead found four adult cats and 12 kittens. "When you work as a rescuer, you see so much hoarding," she says. "You definitely don’t want to be that way. There’s got to be a happy medium somewhere. You can’t grab every single animal." Even Hettie Perry got in trouble several times for having too many cats; therefore, Shelton tries not to judge when she encounters hoarding, and instead just does what she can to help, especially since many hoarders start off with good intentions before their pets become more than they can manage. By facing these harsh realities, Shelton has learned when to say "enough is enough," and she will not let Room 8 pass its maximum capacity of 80 cats, no matter how much certain stories tug at her heartstrings. "I think [hoarders’] intentions are completely good," Shelton says. "I think they are trying to help, but there has to come a time when you say, ‘I can’t do this.’ And it’s really hard to do. I hit a limit of 80 cats, and it doesn’t matter how sad my call is, I can’t take them in because I’m full." Animal rescue has also taught Shelton the importance of spaying and neutering. She receives many calls from people who have litters of kittens they are unable to care for, and she frequently hears the same excuse: They can’t afford to have their pets spayed or neutered. She encourages people to utilize organizations that will provide financial assistance, such as Actors and Others for Animals. Shelton and her husband also trap, neuter, and release feral cats in their area. "You can’t tell me you don’t spend more than $50 on kitten food and all that stuff from the time they’re born to the time you find them a home," Shelton says. "There are resources out there to help you get things done, but you have to reach to find them." Do you know of a rescue hero ÔÇö cat, human, or group ÔÇö we should profile on Catster? Write us at catsterheroes@catster.com. My Cat Sleeps on Me – What’s Up With That?